Stand Up for SINGAPORE: Are PAP grassroot leaders above the law? Are PAP grassroot leaders above the law? It shows a member of the public angrily asking an LTA officer why he refused to “summon” or fine a number of cars that were parked illegally outside the Siglap South Community Centre along Palm Road at East Coast. Apparently, there was, at the time, an event held inside the community centre attended by a PAP MP. The LTA enforcement officer told the member of the public that his superior had instructed him not to issue any summons for those illegally parked cars which purportedly belonged to PAP grassroots leaders. 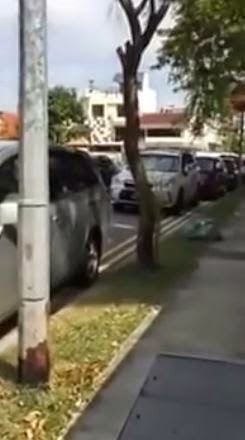 Whether or not the illegally parked cars belonged to PAP grassroots leaders, from the video, the fact that they were illegally parked was obvious. There are double yellow lines along the side of Palm Road and the cars were parked smack on them. Despite the LTA officer sheepishly admitting to the angry citizen that the cars were illegally parked, he did not issue any summonses because he said he was instructed not to. Member of public: Ok, u call ur boss? LTA officer: Yes called already. Member of public: What did they say? LTA officer: He said take picture to send to LTA. Member of public: Ok so are you authorized to give them fine? LTA officer: Yes, but now I inform to my boss already. Member of public: No, are you authorized to give them fine? Member of public: Ok, you are authorized to give them fine right, is this illegal? Member of public: Are you going to give them fine? Member of public: Ok fine, go ahead. LTA officer: But I follow my instruction lah, sir. Member of public: There is no instruction, there is no instruction, this is very simple, we gonna take this in record. 2nd member of public: We gonna send this to STOMP. Member of public: I want to know what’s your job? LTA officer: My job is issue summons lah, sir, but I informed already, this one MP. Member of public: No no, no need to inform anybody, outside you see you all give fine? Member of public: Fine, carry on give the fine, please. LTA officer: I inform already. Member of public: What is there to inform? You mean outside you see illegal parking you inform your boss? LTA officer: Yes I ask first, the situation I ask first, can issue or not. Member of public: How come I park double yellow lines nobody ask, anything just fine, you know? LTA officer: See the serious of the obstruction lah, sir. Do you think the owners of these cars, whoever they may be, are above the law? When was the last time you were able to park on double yellow lines with impunity and were not summoned? And yet protected by LTA officers further? We certainly need to learn from these privileged and powerful car owners how to infringe the law without being summoned. Is Singapore really a democratic country?